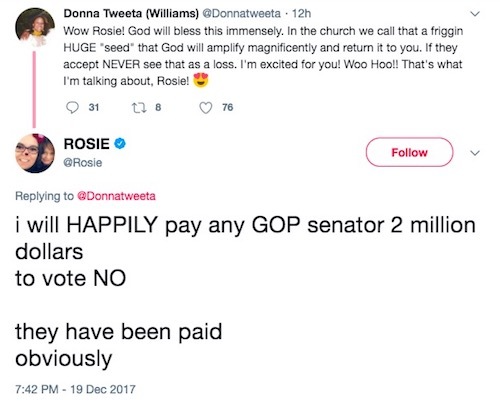 Rosie O’Donnell went on a mental Twitter rant over the tax bill and violated federal law in the process. 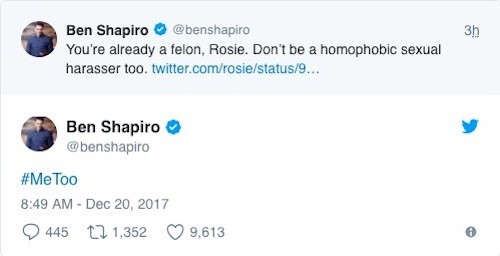 Ben Shapiro calls her out and the exchange was fan-freaking-tastic! 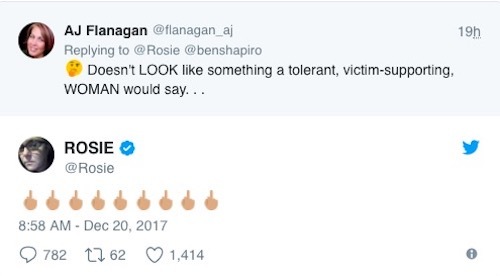 She got called out by conservatives on Twitter. 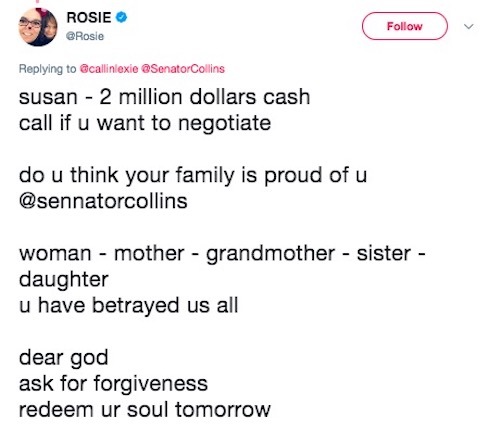 We have to use screenshots with all of Rosie’s tweets because she often gets ‘Twitter Regret’ when she gets called out. The one below has already been deleted. 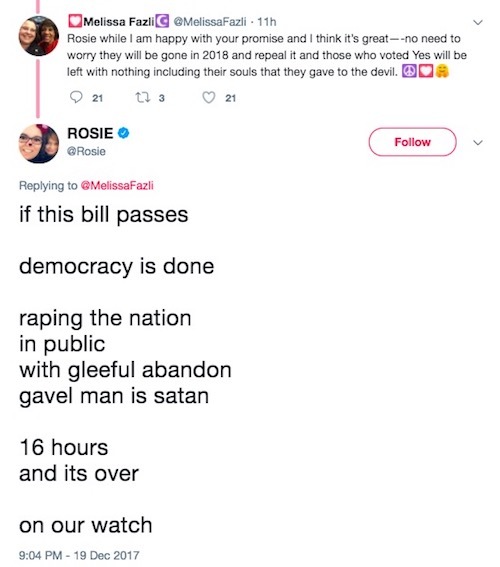 So, was President Trump right about Rosie? 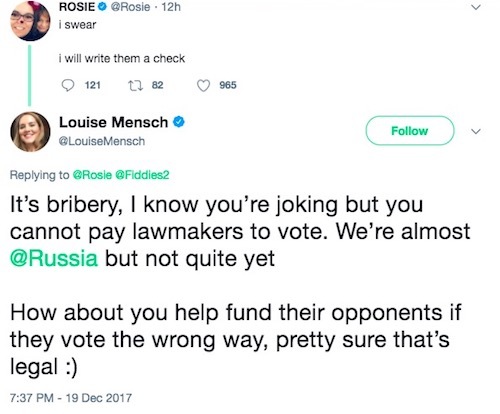 In a twist that surprises no one, a radical leftist tries to use her cash to bribe senators to vote with her ideological agenda. I swear we’re not making that up. 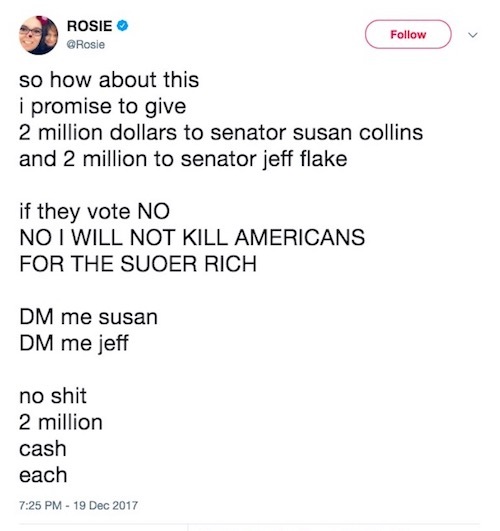 Rosie O’Donnell made a public offer to bribe GOP Senators Susan Collins and Jeff Flake with mucho dinero if they vote against the tax bill. 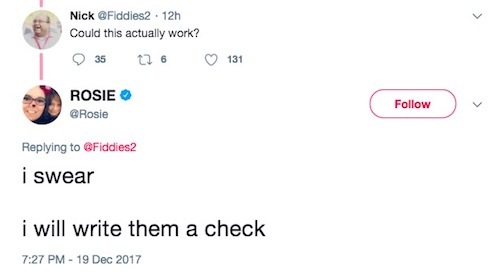 She offered to write them a cheque for $2 million each. You realize what this means, don’t you? 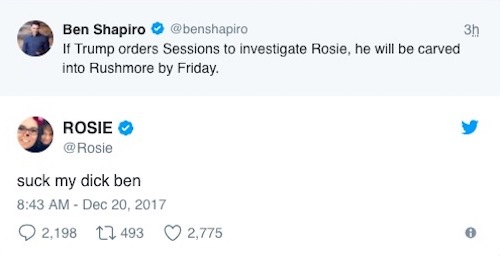 It’s official — President Trump has broken Rosie O’Donnell. She’s completely lost her mind. I give you the screenshots of her Twitter feed as proof. Now, I’m not sure what she means by ‘SOUER rich’. 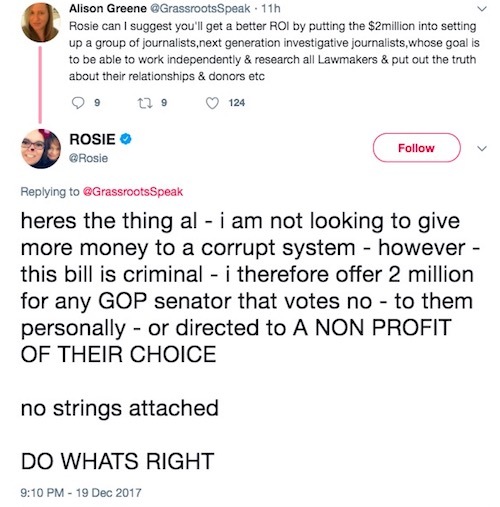 If Rosie hadn’t blocked me on Twitter, I’d probably ask if she meant ‘Sewer rich’ like the swamp rats in Washington that somehow make gazillions while working for the taxpayers or the ones in Hollywood that turned a blind eye while Weinstein harassed, groped, and raped his way through the talent pool. Or perhaps she meant the ‘Sewer rich’ that would offer cash to Senators to change their vote. 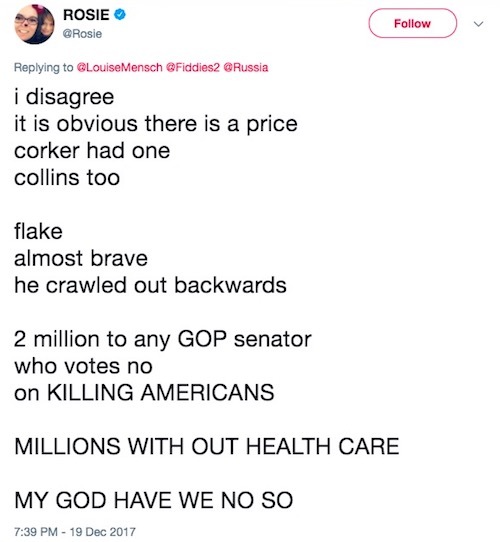 A semi-reasonable response from a Rosie follower, right? No so? No soy? Soy latte? I’ll bet even she doesn’t know. See, here’s the thing… maybe Democrats work that way — having their palms greased — but we expect better from Republicans. 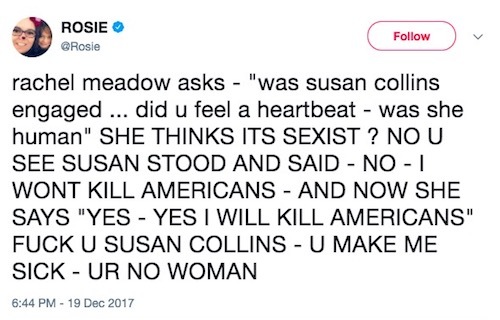 It must be horrible to be Rosie O’Donnell. I mean, that’s true in general, but under the Trump administration, it must be just painful getting up in the morning wondering when the Apocalypse will come. 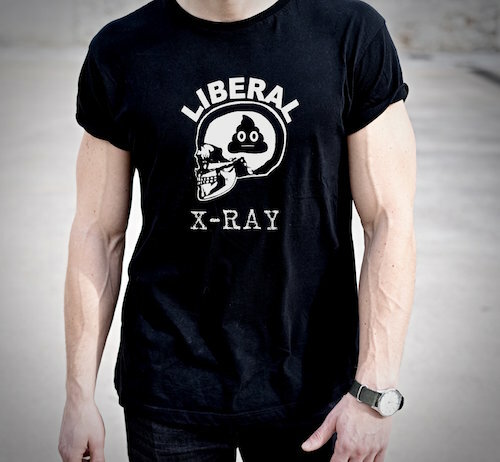 I have a prediction: 2020 when President Trump is reelected. As for the ‘Is that legal?’ part of the headline… quick answer is ‘No’. 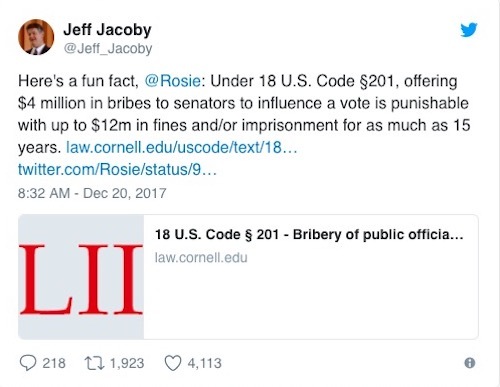 Rosie violated federal law with her tweet. 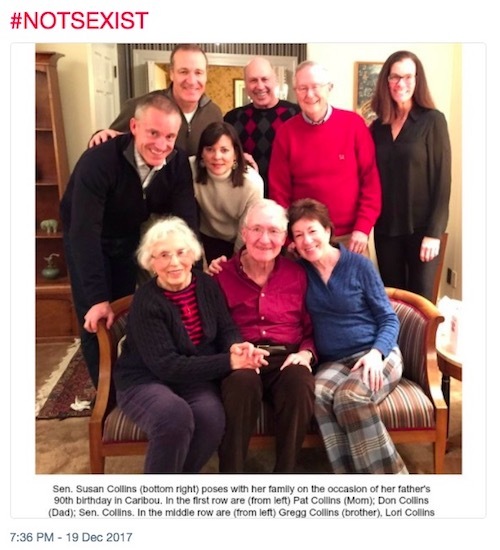 Dear NeverTrumpkins: Trump Has Made Our Government More Moral – How Does Crow Taste? You obviously need a lesson on ‘right and wrong’. You know what will happen if she reads that, though, don’t you? 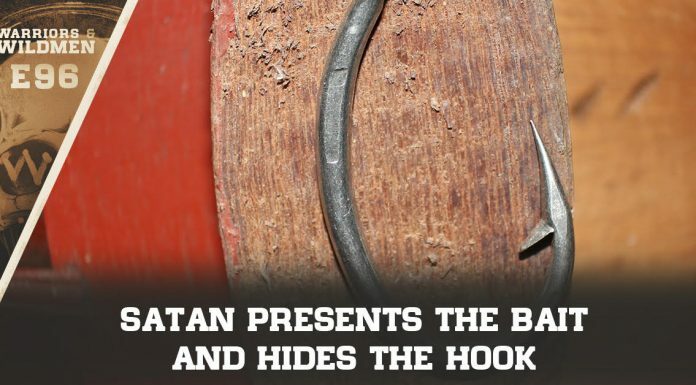 And that will get messy — because you know what’s in there, right?